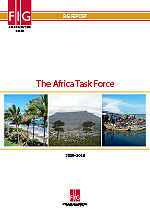 The aim of this publication is to present the objective and work design of the FIG Africa Task Force (ATF), identify the interlinking themes, summarise the contents and outcome of each workshop and make recommendations for the way forward. The FIG Africa Task Force was established at FIG’s 32nd General Assembly held in Eilat, May 2009. The key purpose of the Task Force was to enable the surveying profession in Sub-Saharan Africa to deal with social responsibility in terms of contributing to achieving the Millennium Development Goals (MDGs). Dr. Diane Dumashie (RICS, United Kingdom) chaired the Task Force, led and organised its activities together with members of the ATF. An African member association collaborated with the Task Force to deliver the three workshops organized. In this regard, the Task Force and FIG Council are grateful for and appreciated the support provided by the three local hosts: Institution of Surveyors Kenya (ISK), University of Cape Town & South African Council of Professional and Technical Surveyors (PLATO) and Ghana Institution of Surveyors (GhIS). African Surveying Profession in contributing towards meeting the key challenges of poverty alleviation, economic growth, and environmental sustainability. Our sincere gratitude to Dr. Diane Dumashie and her ATF members for the leadership and efforts in realizing the object and purpose of the Task Force. We also thanked FIG Honorary President Prof Stig Enemark, and the leaderships of ISK, PLATO and GhIS for their advice, support and contributions. Finally, we acknowledge and sincerely thank the inspiration and efforts of the participants of the workshops that ensured the success of this Task Force. The background thinking for the recommendations is a direct output of their ideas and enthusiastic and active participation. On behalf of FIG Council, our sincere thanks to all who participated, contributed, supported and encouraged the work of this Task Force.